PPS5US0002 myGrid Cell Phone Starter Kit... myGrid's drop-and-go technology makes charging your mobile devices effortless while also getting rid of cord clutter. Just put a Power Sleeve or Power Clip on each of your handheld devices and then simply place them on myGrid to charge. 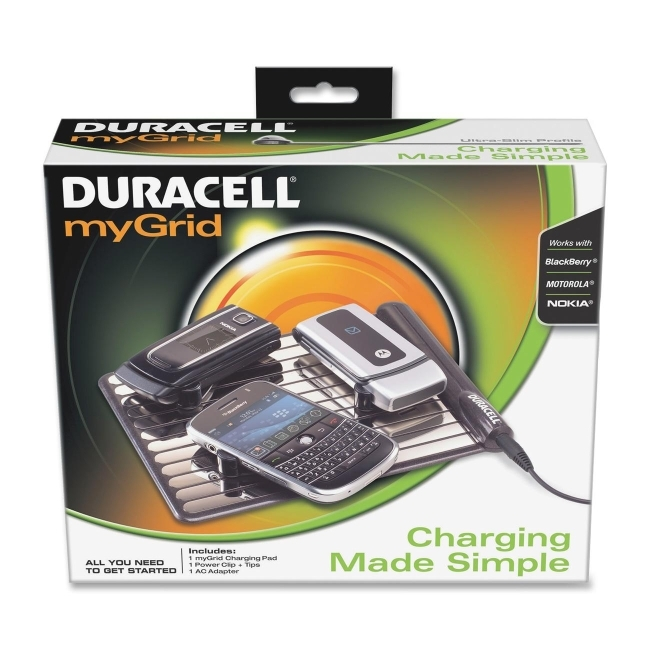 The myGrid Cell Phone Starter Kit comes with a Power Clip designed for BlackBerry, Motorola and Nokia cell phones. myGrid works with most cell phones, handheld devices and MP3 players. FEATURES: Drop-and-go charging for up to 4 devices at once; Safely shuts off when it detects touch; Eliminates cord clutter; Requires a cord, mobile devices being charged do not need a cord; Ultra-slim profile; As fast as standard chargers; Dimensions: 6.75" W x 8.5" L x 0.75" H; Power input: 100 - 240 VAC, 0.4 Amps, 50 - 60 Hz; Power output: 15VDC; 1A; Weight: 4.0 oz. ; Certifications: FCC, ETL.